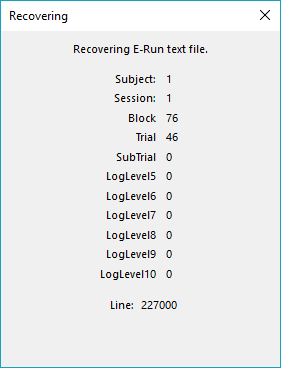 The E-Recovery interface is comprised of four command buttons: Browse, Recover, Close and Help (See E-RECOVERY: Recovering Files  for information about launching the E-Recovery application). 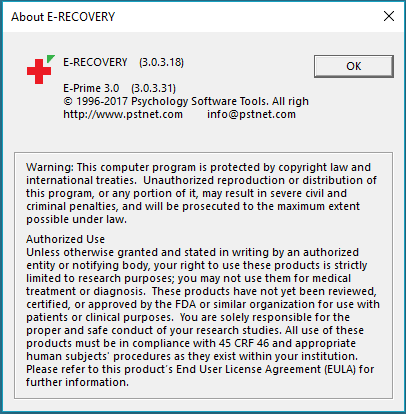 The title bar is displayed at the top of the application screen, and displays the E-Recovery icon and the name of the application (i.e., E-Recovery). The “Recover data in E-Run text file” field will display the text file that is about to be converted to an E-Prime data file. The radio buttons in the “Progress Dialog Options” give choices for three levels of reporting the progress of the recovery procedure. The dialog is only displayed when the TXT file is of considerable length and requires a substantial amount of time to convert to an EDAT file. None Provides no information concerning the recovery of the data file. Simple Provides partial information concerning the recovery of the data file. Full Provides complete information concerning the recovery of the data file. The Full option displays a dialog box providing complete information concerning the recovery of the data file. It rapidly exhibits each block and line as it recovers, in addition to higher-level information (i.e., Subject #, Session #, etc.). The Simple option displays a dialog box providing partial information concerning the recovery of the data file. It rapidly exhibits each line number as the file is recovered. The None option provides the choice of not seeing any dialog box as the data file is recovered. The hourglass icon will be displayed as the data filed is recovered. Browse Selects the E-Run text file (*.TXT) to be converted to an EDAT extension. Recover Converts the data in the text file into an E-Prime data file. Close ALT+F4 Closes the E-Recovery program. Help Provides version information about the E-Recovery program. 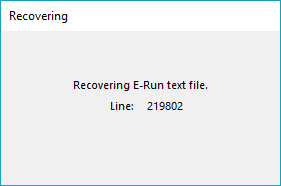 To display application information, right click the E-Recovery icon in the upper left corner of the E-Recovery dialog and select the About E-Recovery command. The About E-Recovery dialog displays version information as well as contact information for Psychology Software Tools, Inc.